SAES DF Tablets offer a package that allows easy mounting of the getter in a lamp. The configuration maximizes the exposed surface of the getter material. The presence of the metal tab allows easy mounting and welding of the getter into the lamp jacket. The extremely high dimensional reliability makes the DF ideal for use in high-speed automatic feeding systems. The volume of the getter assures a large sorption capacity; at the same time porosity of the getter body allows high sorption speed due to the increased value of the actual active surface. The DF getters can be used in lamps with jacket under vacuum, under nitrogen and under inert gas. St101 is SAES Getters’alloy that is used in high temperature applications and if it is necessary that the getter does not operate during the manufacturing process. St198 is SAES alloy that was made into DF tablets to offer a getter for lamps with lower activation and working temperatures than St101. Its hydrogen sorption is not as efficient as that of St101. 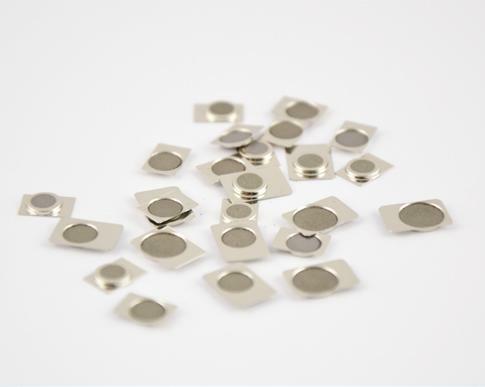 St101-198 is a 1:1 mixture of the two alloys which attempts to capture the best qualities of each alloy—the low activation temperature of St198 and the high hydrogen sorption of St101. SAES newest alloy for HID lamps, St787 is an alloy that activates at low temperature. St787 has several advantages over the other alloys. St787 has much greater hydrogen sorption than all the other alloys, and sorbs CO about as well as St101. Thus, St787 offers the best performance combination for activation and working temperatures and hydrogen sorption capacity. The St777P getter alloy is able to meet the unique requirements of today’s discharge lamp. The St777P was designed to exhibit the lowest equivalent pressure against hydrogen, fastest sorption speed and highest sorption capacity. St777P also exhibit the most advanced performance in removing active gases such as Oxygen - Carbon Dioxide/Carbon Monoxide – Water – Hydrocarbons. It can be used both in Vacuum and Nitrogen filled lamps. A specific activation step of DF Tablets is possible. Activation parameters of the four alloys are shown below. 800°C for 5 min. 800°C for 3-5 min.